Sept 18, 2018: the official cheque presentation. Third from left is Bev Norman, Client Liaison; 2nd from right is Sonia Swenson, Volunteer Coordinator, both of Airdrie Meals on Wheels. Thank You, Ladies! 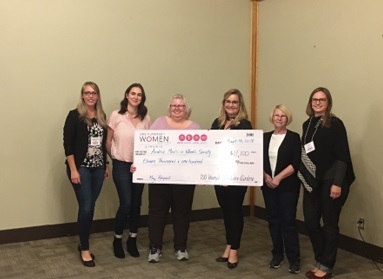 On the 29th of May, Airdrie Meals on Wheels was fortunate to be one of three charitable organizations in Airdrie selected to present to a meeting of 100 Women Who Care. This wonderful group of Airdrie women meets 4 times a year, donating $100 each at every meeting, and award this money to the organization that they feel will spend it to do the most good. We had some stiff competition, very compelling and heartfelt, and we described the work done by our volunteers and the benefit it provides to Airdrie residents. At the end of the evening, the members of 100 Women Who Care voted… and Airdrie Meals on Wheels was gifted the pot of more than $10,000! We are honoured and thrilled to be the recipient this time, and thank these amazing women of Airdrie for their generosity and warm hearts. The money will be spent on funding the meals our clients receive and deserve. Thank you 100 Women Who Care!